That’s what the headline might’ve read if the 19th century world had been more concerned with conservation. The Galapagos Islands were treated as a supply station by ships, particularly whaling vessels, which had most reason to pass through the eastern Pacific. 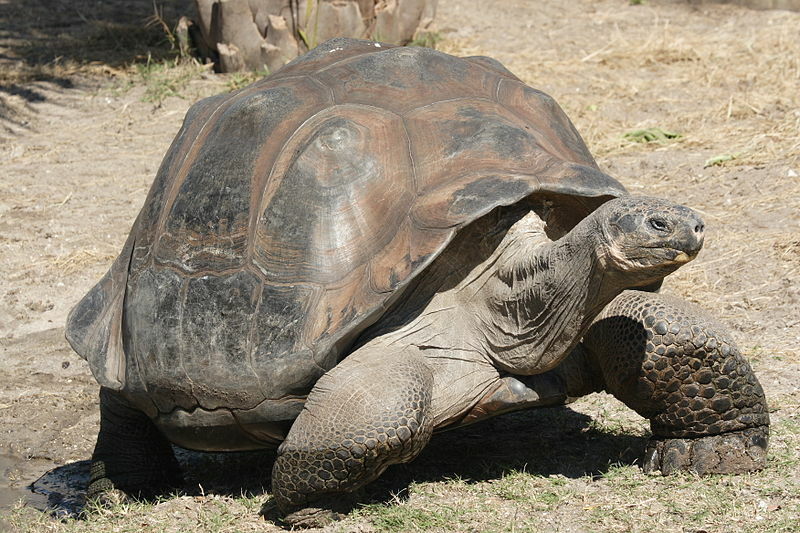 The sailors would go onshore and help themselves to vast numbers of the giant tortoises – the same species that fascinated Darwin, helping him shape his theory of evolution, and gave the islands their name ( Spanish galápago – tortoise). The ability of the tortoises to survive for a long time without food or water meant they were a convenient source of fresh meat on the interminable sea voyages of the era. The tortoises were easy to catch but heavy to carry so the smaller sized females were disproportionately taken – another factor contributing to their decline. In 1813, the Essex of the US navy reportedly carried off as many as 4 tons of tortoises. Many huge turtles had carved on their backs the name of some whaling ship and a date of years before. I have often heard tell that a vessel went over from Panama with two donkeys and procured terrapin so large that two of them weighed 2,200 lbs. We had brought long iron poles with us and we lashed the terrapins’ legs together, slung them on the poles and so carried them back to the ship – one man on each end of the pole. We valued them very much for fresh meat. I don’t think anything ever tasted much better than fried terrapin liver. One thing we used to feed the turtles on board ship was bananas. However, the greatest impact on the tortoise population was made when humans began to settle in the “the lonely archipelago”, with their accompanying domestic animals. Numbers dropped from over 250,000 in the 16th century to a low of around 3,000 in the 1970s. Conservation efforts involving breeding programs and culling of introduced species have brought about a small recovery to around 20,000.